General Surgery, Multi-Organ Transplant, University of Toronto, Toronto, ON, Canada. Caval replacement (CR) and piggyback (PB) techniques for deceased donor liver transplantation (DDLT) each have inherent advantages and disadvantages with no consensus on the optimal technique. We reviewed our institutional experience in the context of a high volume liver transplant unit with a dedicated liver transplant anesthesia team. The study group consists of DDLTs performed from 2000-2014. No cases were performed on veno-venous bypass. PB venous outflow reconstruction consisted of two types: (1) caval anastomosis to the cuff of the left/middle hepatic veins and (2) side-to-side cavo-cavostomy with or without resection of the caudate lobe. Re-transplants and split liver transplants were excluded from the analysis. 1076 CR and 162 PB liver transplants were performed during the study period. MELD score and indications for transplantation were similar between groups, but a higher proportion of the PB group was hospitalized in the ICU prior to transplant (13.3% vs. 7.3%, p = 0.02). 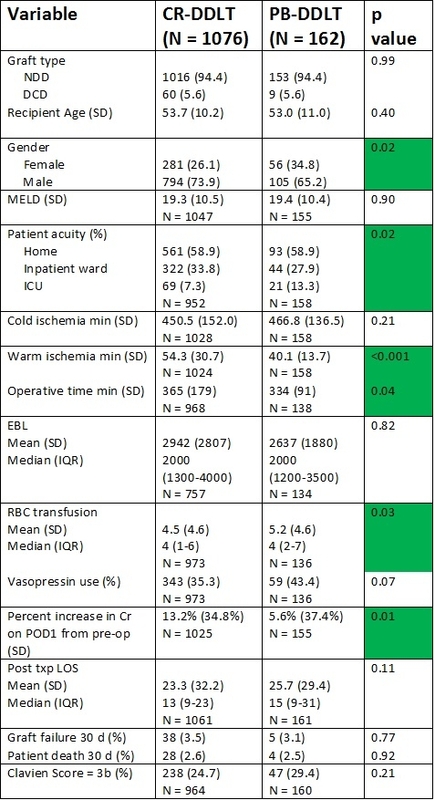 The PB group had a significantly shorter warm ischemic time (40.1 vs 54.3, p <0.001) and overall operative time (334 vs. 365 min, p = 0.04). There was a modest improvement in the early postoperative serum creatinine in the PB group (5.6% vs. 13.2% increase from baseline on POD1, p = 0.01). There were no differences between groups in serious post-operative complications, 30 day graft loss, and 30 day patient mortality. In the setting of a high volume transplant unit with a dedicated anesthesia team, both caval replacement without veno-venous bypass and piggyback techniques are safe and effective. In our experience, the piggyback approach appears to have shorter warm ischemic and operative times with modest improvement in creatinine kinetics early after surgery. CITATION INFORMATION: Barbas A, Dib M, Goldaracena N, Marquez M, Sapisochin G, Al-Adra D, McCluskey S, McGilvray I. Caval Replacement versus Piggyback Liver Transplantation: The Toronto Experience. Am J Transplant. 2016;16 (suppl 3). Barbas A, Dib M, Goldaracena N, Marquez M, Sapisochin G, Al-Adra D, McCluskey S, McGilvray I. Caval Replacement versus Piggyback Liver Transplantation: The Toronto Experience. [abstract]. Am J Transplant. 2016; 16 (suppl 3). https://atcmeetingabstracts.com/abstract/caval-replacement-versus-piggyback-liver-transplantation-the-toronto-experience/. Accessed April 21, 2019.